So I've tried and tried, but growing my nails naturally it's not working. I've never had natural nails. I sure want to, that's not the problem. I did everything and taken good care of my nails. So next week I'm going on a holiday (yesss) and the week after our holiday I will back with my acrylics. So I've got a week to think about a brand new design with glitters, cos this has been requested so many times on youtube. Still trying to grow my own nails, but they havent grown that much. I'm not giving up, cos I really want to have long natural nails. They are stronger and they have grown, but just a little bit. You really need a lot of patience. I've painted my nails with Nfu Oh. 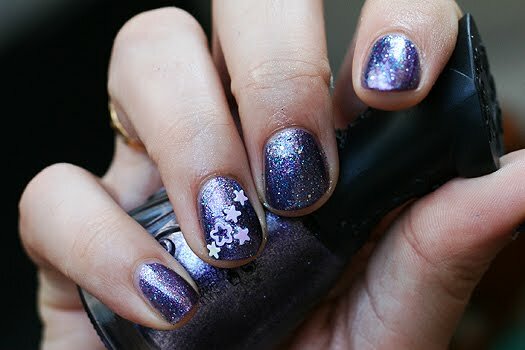 On top a glitter coat and on my ring finger I've chosen some cute hologram nailart. Very simple, but looks nice. But beeing very honest I do not really like this Nfu Oh color number 068. It is not my kind of thing. For now I'm going to enjoy my freshly painted nails :). My nail friends...enjoy the summer weather. So today, I had a little doubt about keep on going growing my own natural nails. I'm a fake nail acrylic girl. So nasty (not that nasty, but nasty in a good way ;), but I love it :). But I'm sick and tired to keep the acrylics onto my nails. It is a lot of work. I'm lazy you know :). No not that lazy, I just don't want them on my nails anymore. I'm thinking about doing acrylic tuts for Youtube on a fake practise finger. 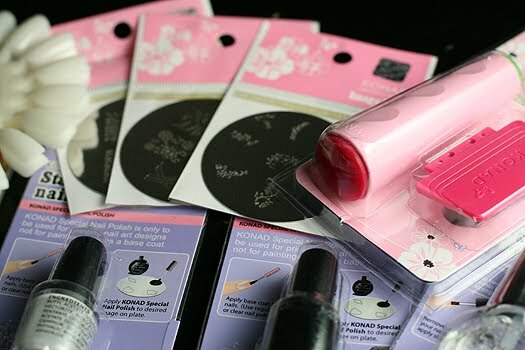 It is a option and the nail art stuff on my on natural nails. My nails are kind of short at the moment. Maybe you wonder how that is possible, cos I have been gone for 3 months. The thing is my nails had to grow out, cos of the acrylics. So they are now all grown out and now I can start to let them grow longer. I hope they will. Follow these steps for natural long nails. This was my very first attempt to use Konad. I almost threw the whole Konad stuff into my bin, cos the stupid stamper wouldn't stamp the image! Finally with some help from my other nail buddies (Jessica and Rachel) I succeeded! I also found a helpful video if you have any problems with your Konad stamper. Click here for the video. I think it looks horrible, but I have to practise. You can see the stamps looks kinda blurry. But hey it was my first time right :). The polish on my nails is from OPI Chocolate Moose, I did the stamping with Konad polish in brown color. I've used Konad imageplate number 37. 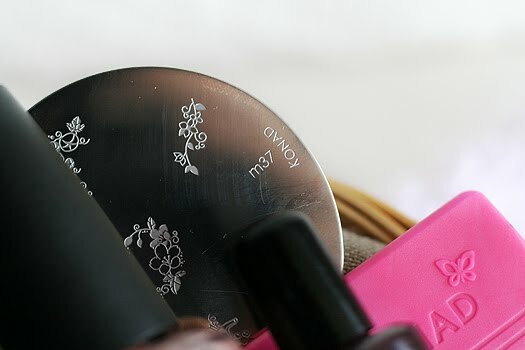 So wish me luck for my next attempt for Konad stamping. It is fun :). My first Konad purchase. Seems that I'm the last person on this earth who had no Konad stuff. Today I received my purchase. I've ordered my Konad stamper and imageplates from a dutch webshop Boozyshop owned by Maaike. She's very kind and very fast service. On my collection page I will be sharing my collections of my favorite brands. So this is not my entire collection of polishes, only my favorite brands, like OPI, China Glaze and Nfu OH (I hope I can add the Nfu Oh polishes this afternoon). Why am I doing this? Well because I always love to see other nailpolish addicts collections. So I thought it would be fun. Right? Here we go. So I will be checking my post like a hawk today, cos I've been checking out my tracker for my order Nfu Oh polishes. I'm so excited! Maybe my order from Boozyshop will be in the post today too? So I have created a account for Facebook and Bloglovin. Are you going to follow me? I would love to follow you out there. Just click on the buttons to go to my pages. Look at them pretty colors!!! All photos and content copyright by Nails4stars.